To log in and access content in the curriculum, cookies must be turned on in your browser. 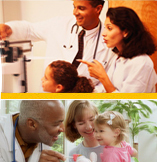 Pediatrics in Practice offers online courses and in-person training in health promotion. View our offerings below. Enrich your knowledge and skills in Bright Futures and health promotion. Enhance your skills through interactive faculty development. Integrate health promotion into your practice and community. Welcome: Visitors will now notice that it is easier to navigate to the many resources on our website. Enjoy your experience.